Serious Speeding - the law, the fines. Re: Serious Speeding - New law, new fines. It used to be like that, I think today you can choose the starting date of the ban, within the court's chosen 14 day period! It can also be postponed for extenuating circumstances but they have to be good. I finally got informed how it ends...received a post from Strassenverkehrsamt Zurich about the driving licence consequences: I have received a warning, saying that if for the next 2 years similiar thing happens I will lose my driving licence for _at least_ 3 months. For now it's ok. Regarding fine, they said I will receive separate post with bill to pay, however person I spoken to by the phone didn't know how much it will be. They only said I will receive separate bill to pay from them and separate one from "Statthelteramt Horgen". Then yesterday I've received another letter from Statthelteramt with numbers. I finally got informed how it ends...received a post from Strassenverkehrsamt Zurich about the driving licence consequences: I have received a warning, saying that if for the next 2 years similiar thing happens I will lose my driving licence for _at least_ 3 months. For now it's ok. Regarding fine, they said I will receive separate post with bill to pay, however person I spoken to by the phone didn't know how much it will be. They only said I will receive separate bill to pay from them and separate one from "Statthalteramt Horgen". 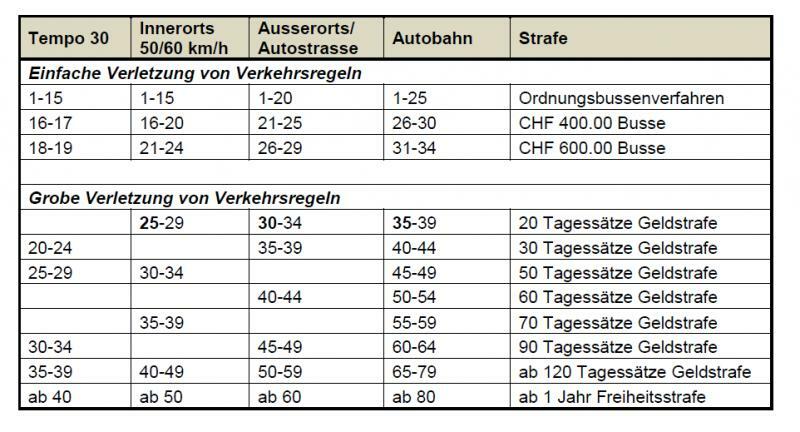 Their (Strassenverkehrsamt Zurich) bill for the Verwarnung will be another CHF 250..
Is there a similar applicable chart that shows a correlated speed offense in km/h in brackets vs the months ban one receives therein, or would this vary from Kanton to Kanton? These things are done on a case by case basis, with variability depending on all sorts of things, possibly including what side of bed the judge got out of on a given morning. The seriousness of the offence isn't solely based on the amount over the limit, but also would take into account what the road and traffic conditions were like as well as your own driving record. The first one has the heading "Einfache Verletzung der Verkehrsregeln /Simple infraction of traffic rules". This has two subbrackets, the infractions labled with Ordnungsbussenverfahren. This will end in a simple fine as defined in 'the official price list', no warning, no ban (but only if you did not endanger anyone at all). Anything which cannot be resolved with a Ordnungsbusse/Simple fine will result in front of the judge and you risk at least a warning Art 16 Ziff 2 SVG. Warnings are defined in Art 16a SVG. If you had a warning or a licensense suspension in the previous two years your license will be suspended for one month. But depending on road condition/weather/visbility/traffic etc. it could also mean a suspension according to Art. 16b. This will be at least a one month ban for first time offenders and at least four month if there was a suspension in the previous two years. Repeated offenders risk a life time ban. The second bracket has the heading "Grobe Verletzung von Verkehrsregel/ Serious infraction of traffic rules". This will result in a license suspension of at least three month according to Art. 16c. Repeated infractions will result in a longer suspension up to a life time driving ban. If you comit any of the infraction labled with "ab 1 Jahr Freiheitsstrafe/at least one year jail" you will get at least a two year license suspension. Art. 90 and Art. 16c. Here are the problems: The law says "at least" you may get more than the minimum. The table above is only the normal case certain cicumstances may shift the definition between simple infraction and serious infraction. The table is what the prosecutor request not what the judge will give. It is not the judges decision how long the suspension will be, it will be the traffic departement who will decide based on the judges rulling and the law. Sorry, i didnt quite get it, in which cases you can go to jail for speeding? You're wrong. It's most often a status thing, and not a boy racer complex. Lots of people in Switzerland buy supercars and don't even drive them because the Merc is more comfortable anyway. Oh but indeed, these also say a lot about their drivers. I'd risk to say that owners of these cars are statistically more likely to end up in jail for speeding. What I am saying is that.. With these rules, pedestrians are pushed to thing that crossing a motorized street is their right and some might be pushed to not even look as the know that everyone MUST be driving at a decent limit, putting all their faith in drivers that may not see nor care about other's life. But if the culture is set to not care while passing the streets than that's rather sad. Point is LOOK before you are crossing the streets. And it would be great to cut on those silly, slightly retarded fines / court things. I don't currently live in Switserland. You're not really in much of a position to comment on Swiss driving laws, then, are you? Dear fella, I am travelling a lot by car across Europe and, sorry, but your comment sounds rather communist'ish - I think I am allowed to express an opinion, am I not? Here we have blind and poorly sighted people using the road and sometimes crossing them too. Our children go to school by themselves and crossing busy roads during the rush hour, even from the age of 5 to 7 years old! On your next visit here, please drive very carefully. Foreigners can be fined and jailed as well as the locals! This guy has a point, Darzales. Did you know that Swiss law requires drivers to STOP the vehicle if there is a pedestrian just waiting to cross the road? Even if they are not yet on the zebra stripes? So there is no "look both ways" for pedestrians here at all. They can walk out in front of you without looking and you the driver are at fault, whether you are speeding or not. The speeding fines are set with safety in mind, but they are not just to do with pedestrians that don't bother to pay attention. I think this was changed last year and the pedestrian has to make eye contact with the driver or wait until he stops before crossing. At least in Zurich that is. Read the second post on that thread. No change to the law (at least outside of ZH), just some good advice to drivers and pedestrians.